A history of the speaker, reader, and interpreter from 500 B.C. to 400 A.D.
722 B.C. The Assyrians conquered Israel and later Judah. Aramaic becomes the common language of the Israelites. @460 B.C. Ezra brings Hebrew back as a religious language. The Aramaic Jewish audience hears the Jewish traditions but do not understand. The tradition begins: a person reads and/or instructs in Hebrew while an interpreter stood nearby simultaneously translating into Aramaic. Afterwards, the Greeks ruled most of the known world. The Greek language became the international language of law and commerce. There was no escape from the Greek influence. The Greek Jewish community adapted the Aramaic Jewish liturgy of instruction and/or reading in Hebrew with a spontaneous interpretation. A conflict arose in Corinth over whether Doric (their native dialect), Attic, or Aeolic should be the standard Greek language for translation and other religious needs. 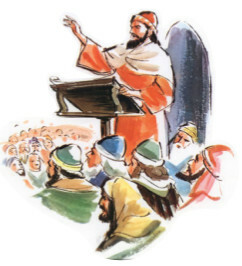 Speaking and interpreting was one of many issues confronting Paul while involved with the Messianic Jewish Community in Corinth. The synagogue act of public reading in Hebrew has evolved and is still in use today. The relationship between the gift of tongues and the ancient Jewish liturgies are greatly overlooked in contemporary discussions. Judaism discontinued the Hebrew instructor after 400 A.D. Christianity removed it from their customs around 100 A.D. The use of an interpreter in both the Jewish and Christian liturgies were phased out in the Medieval Age. The importance of the public reader, instructor, and interpreter were critical features of first-century Judaism. It is estimated only 10 to 15% of the people who lived in Roman Empire during this period were literate. Image of Assyria relief from the British Museum (fair use under their creative license). Ezra illustration licensed from www.goodsalt.com. The following are from the Wikipedia Commons license: The Alexander sarcophagus, painting of St. Paul by Rembrandt van Rijn, image of the public reader in the synagogue. These two ancient practices, their effect on the Corinthian assembly, and passage up to the fifth-century. As explained in the background, the Corinthian assembly inherited the Jewish traditions started by Ezra. The following data are the results of of the Gift of Tongues Project. the Jewish Messianic assembly in Corinth. Paul’s explanation of the speaker/interpreter in Corinth is one of the earliest displays of the custom since the times of Ezra. 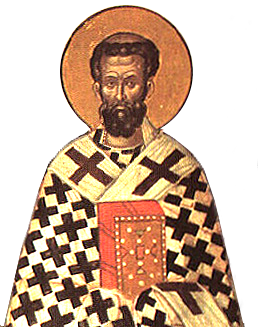 Epiphanius, Bishop of Salamis (fourth-century), believed Hebrew was a source of conflict at Corinth. --Panarion, Refut. 13 and 21. He further believed a conflict arose in Corinth over which Greek language was to be the principal one for interpretation and worship. Doric (the native tongue of Corinth), or Attic (the most popular Greek language throughout the empire), or Aeolic (a central group of Greek dialects) were competing for primacy. See Epiphanius on the Problem Tongues of Corinth for more details. 250 A.D. Jewish institutions still practiced this rite. The church continued these rites but Greek took over as the primary language. 290 A.D. Procopius of Scythopolis. He had the duty to translate from Greek to Aramaic during the service. 350 AD. The travel diary of Egeria fills in some clues. She wrote in her diary about a typical church service in 4th century Israel. The priest would speak in Greek and an interpreter would immediately translate it into Aramaic. The priest would speak in a high priestly voice. An intermediary would explain it to the general audience. Research has uncovered nothing about this rite after the fifth-century. Later Jewish leaders found that the interpreter took too many liberties and this caused friction. See Ecclesiastes Rabbah 7.5 or the article The Language of Instruction in the Corinthian Church for more details. No data has been uncovered so far about the removal of the interpreter in the rites of the Christian Church except that the office is never referred to after the fifth-century. Image of the two columns in Corinth used with permission from Dreamstime.com. Epiphanius, Procopius, and the Coptic cross are Wikimedia Creative Commons. 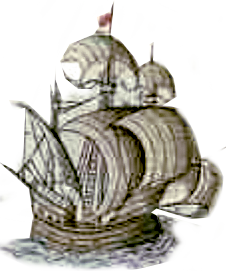 The ship image is from Theatre de L'Univers par Abraham Ortelius. 1572. Pg. 225. All other images created by Charles A. Sullivan. The Reader reads from the Scriptures in Hebrew and a nearby translator immediately translates it into the common language. This tradition began around 450 B.C. Public Hebrew reading is still practised in many synagogues today. The rite of interpretation has been discontinued. The Talmud Documents the role and function of the public reader and interpreter(s) in the Jewish faith. Corinth and the early church inherited the custom of public reading. Hebrew was dropped for Greek. Greek was dropped for Latin in the Western Church. Latin was dropped for local languages in the Protestant churches. He felt the public reading of Scripture and the leadership of the reader were of critical importance to the church. The Apostolic Constitutions (@375 A.D.) refer to the public reader tradition founded by Ezra being continued in the church by the apostle Matthew. (mid 1200s A.D.) was convinced that the public reader replaced the gift of tongues. The art of publicly reading the Scriptures is still practised by the Catholic, Eastern Orthodox, Eastern Catholic, and Anglican Churches. Is the public reading of Hebrew the answer to the Corinthian conflict? A big part of the solution but incomplete. See the interpreter/speaker tab for more clues. 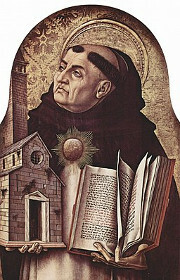 St. Cyprian (modified), and Thomas Aquinas used under the Wikimedia Creative Commons license. The Jewish Public Reader (modified) but also from Wikimedia Creative Commons. Attribution: "The Presentation of The Torah", Edouard Moyse (1860) - Musée d'art et d'histoire du Judaïsme. Church image CC0 https://pixabay.com/en/panorama-rome-italy-church-dome-2154463/. All other images created by Charles A. Sullivan. The tongues of Corinth from a Jewish perspective is not well known. There are four, and especially one, that get way more airwaves. Early Catholic writers and leaders do not literally address Paul’s statements on tongues except two and a half writers; Epiphanius, the Ambrosiaster text, and a tad owing to John Chrysostom. This is largely due in part to earlier church writers emphasizing allegorical and/or promoting personal obedience rather than a critical interpretation of the Bible. Read A Catholic History of Tongues for more information. This interpretation framework believes that any miracle, including that of speaking in tongues, died with the early church and could never be repeated. Therefore, any research on the Corinthian tongues saga is only for historical purposes. The tongues of Corinth have no impact on the modern Christian life. Read Cessationism, Miracles, and Tongues for more. Higher-Criticism is the dominant modern theory of explaining the tongues of Corinth and Pentecost. This doctrine believes that the christian rite of tongues has its origins with the Greek prophetesses at Delphi. These women performed inside a temple that had fissures underneath issuing volcanic fumes. The inhalation of the fumes would put the prophetess in an ecstatic state and would prophesy in what was believed to be unintelligible utterances. Ecstasy, glossolalia, and ecstatic utterance are keywords for this interpretational system. The higher-criticists supposed the earliest Christians synthesized this ancient Greek rite as part of making Christianity a universal religion. Church writings and ecclesiastical history are willfully excluded from this premise. Read the History of Glossolalia series for more. Most of the leaders in these movements rely on other tongues found in I Corinthians and one instance in the Book of Acts to substantiate their tongues doctrine. Some call it a private prayer language, while others name it glossolalic prayers. In fact, other as in other tongues does not exist in the original Greek of I Corinthians. The adjective other was added to I Corinthians by European Protestant translators as a polemic against the Catholic Church. The Protestant translators never intended this idiom as a strange or mystical experience. Read the Pentecostal Tongues series or the article, The Unknown Tongues in the English Bible, for more information. See the The Gift of Tongues Project for more information. The images of Epiphanius, The Westminster Confession, and August Neander are used under the Wikipedia Creative Commons license. All other graphics copyright Charles Sullivan.